Described as the “complete game changer” at Lainey LifeStyle. Zika virus message: The active ingredient in SAFE is the only natural repellent approved by the Centers for Disease Control and Prevention (CDC) for complete protection against mosquitoes carrying the zika virus. SAFE has been specifically tested to show long-lasting effectiveness against the aedes aegypti mosquito - the main mosquito vector for the zika virus. SAFE: The World's most effective natural insect repellent. You cannot buy a more effective natural repellent. SAFE from mosquitoes, sandflies and all other biting insects. Highly effective (over 8 hours protection by independent laboratory testing). Pleasant light aroma, non-greasy and non-irritating. SAFE is nature's most effective long-lasting insect repellent. Over 8 hours protection against mosquitoes, sandflies, ticks, leeches, midges and other biting insects. Use in any country for complete protection. Two testimonials: "As part of our travels we spent five days in the lowlands (jungle area) close by Trinadad/Santa Cruz in southern Bolivia. The trip involved an excursion down two rivers described as the Bolivian Amazon by way of Flo-tel (floating hotel or river boat). This area is notorious for mosquito bites. We are pleased to advise that all four members of the family were suitably impressed with the quality of the spray product on hand. We confirm it lasted for at least seven-eight hours in what we would describe as relatively hostile territory. Kind regards, Lincoln & Shelley." More effective than deet repellents! Independent studies by i2L research (Figure1, see Study code 13/396 for more details of the study) have found SAFE to have long lasting effectiveness against New Zealand's nasty biting mosquito Culex quinquefasciatus (the one whining around you in your house in the evening). SAFE gave 100% complete protection from mosquitoes landing for all subjects for the entire duration of the 8 hour study! 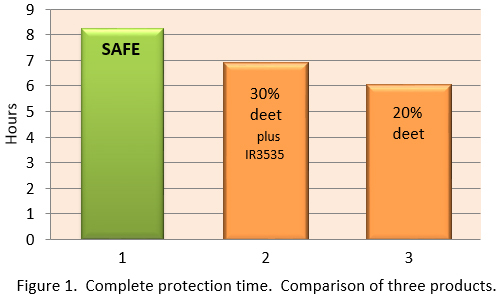 SAFE provided longer protection time than a 20% deet repellent, and also longer protection time than Repel tropical strength repellent (containing both 30% deet repellent and 3.75% of the synthetic repellent IR3535). So now you can have a completely natural repellent that works better than synthetic repellents. SAFE provides long-lasting effectiveness against the yellow fever mosquito, Aedes aegypti. Aedes aegypti is also the main mosquito vector for the zika virus. An independent study using the arm-in-cage test (Study code 13/378) concluded that SAFE repellent spray was "highly effective against mosquitoes, Aedes aegypti, offering complete protection for almost 6.5 hours post application." SAFE effectively repels all New Zealand biting mosquitoes (12 species) and biting sandflies (2 species: the New Zealand blackfly and the Westcoast blackfly). Independent scientific studies have found the active ingredient in SAFE to have long-lasting effectiveness against all mosquitoes tested, including: Aedes aegypti (Yellow fever mosquito), Aedes albopictus (Asian tiger mosquito), Aedes cantans (Brown saltmarsh mosquito), Aedes increpitus (Woodland mosquito), Aedes melanimon, Aedes taeniorhynchus (Black saltmarsh mosquito), Aedes vexans, Anopheles albimanus (New world malaria mosquito), Anopheles arabiensis (Southern African malaria mosquito), Anopheles darling (American malaria mosquito), Anopheles freeborni (Western malaria mosquito), Anopheles funestus, Anopheles gambiae (African malaria mosquito), Anopheles quadrimaculatu (Common malaria mosquito), Anopheles stephensii, Anopheles sundaicus, Culex quinquefasciatus (Southern house mosquito), and Culex sitiens. An insect repellent should have independent studies to demonstrate how effective it is. We don’t just field test our SAFE repellent, we have it independently tested under the most rigorous and demanding laboratory conditions. This testing follows the EPA Product Performance Test Guidelines and the WHO Guidelines for efficacy testing of mosquito repellents. Put your arm in a cage full of 100 starved blood-hungry mosquitoes. Use aggressive biters that can be difficult to repel, for example the yellow fever mosquito (aedes aegypti). See how many land on your arm - that’s right, forget about biting, we use the ultimate test of not even landing on your arm. Under these rigorous testing conditions SAFE gives over 8 hours of protection as measured by Complete Protection Time (CPT) against any landings. If a mosquito doesn’t land on your arm in a small cage it’s definitely not going to find you when you’re standing around the BBQ! SAFE is made from the leaves of the lemon eucalyptus tree (Eucalyptus citriodora). A renewable and sustainable resource. It has long been known that the lemon eucalyptus tree has insect repellent properties. Unfortunately it is not particularly effective as the main active repellent in the leaves, p-menthane 3,8, diol (PMD), normally occurs only at low concentrations. We acidify and fractionally vacuum distill lemon eucalyptus essential oil to increase and concentrate the PMD content. The final result is pure PMD for maximum effectiveness. PMD is related to menthol, the 'minty' component in peppermint. It is the only plant-based active ingredient recommended by the Centers for Disease Control and Prevention (CDC). You can read "Mosquito repellents: Lemon Eucalyptus Oil is not Oil of Lemon Eucalyptus." in my Consumer Information section for more information about PMD. SAFE is completely natural. The other ingredients in SAFE are deionised water, our own organic alcohol which we make and distil here on site, and a touch of natural vanillin and sandalwood essential oil. No synthetic repellents like deet, picaridin or IR3535. No citronella, or other smelly essential oils. No preservatives. Full ingredient list: p-menthane 3-8-diol (PMD)*, deionised water, organic alcohol, vanillin, santalum album (sandalwood) oil. * obtained from lemon eucalytus. The synthetic insect repellent deet has a number of known problems. It dissolves plastics, synthetic fabrics and materials, and painted and varnished surfaces. So it may make a mess of your sunglasses, clothing, handbag or nail varnish! Deet also easily passes through the skin barrier into the body, taking with it any other chemicals present. Finally, mosquitoes are building up a resistance to deet, requiring the application of increasingly heavier doses for it to work. Essential oils do not have long-lasting effectiveness. Many insect repellents use essential oils such as citronella, geranium, lemongrass, clove or tea tree. Unfortunately these oils are often smelly, are readily absorbed through the skin into the body, and are potentially irritating at the concentrations needed to repel insects. Most importantly, no matter what combination you use, they do not have long–lasting effectiveness. Due to their low efficacy these essential oil products typically have no independent testing to back any claims. What do you do when these essential oils stop working after an hour or two, or even much less? It is simply not convenient, or safe, to keep re-applying them. These essential oils also typically vary tremendously in their effectiveness for different people. For many people the protection may be less than 30 minutes, or even no protection at all. An effective insect repellent must be reliable, it should work for all people at all times (against any species of mosquito no matter how hungry they are, or how attractive you are to them). SAFE has a pleasant light aroma, and it is non-greasy and non-irritating. Unlike many insect repellents SAFE is pleasant smelling, with just a very light minty-vanilla aroma. No citronella or other smelly essential oils. SAFE is kind to your skin. It is non-irritating and is not a skin sensitizer. It is not oily or greasy. Lightly spray with a sweeping motion. Or, to avoid over-spray and waste, spray into hand and spread over body. As with any insect repellent be sure to cover all exposed areas. Do not spray directly onto the face. Spray into hand and then spread on face. Pregnant and breastfeeding women can use SAFE. As with any insect repellent please keep out of reach of children. Do not let children apply this product to themselves as it can cause eye irritation. Do not apply to infants under 6 months. Infants and young children should be protected by other means as much as possible, such as suitable clothing, to minimize repellent use. Avoid eyes and mouth. SAFE causes moderate eye irritation. First Aid (if in eyes) Hold eye open and rinse gently with water for 10 minutes. Remove contact lenses, if present, after the first 5 minutes, then continue rinsing eye. Discontinue use if any skin irritation appears (this would be extremely rare). Do not apply over cuts, wounds or irritated skin. We have been using SAFE for about a year. This last summer we have had lots of mosquitoes around especially if we keep windows open at night.With SAFE applied no mosquito bits in the morning. Occasionally forgot to apply and if bitten spray on SAFE, quick sting then no more itching. I have been using Safe for 3 years now and it never fails to impress.I seem to attract everything that bites my way and as we travel lots and I have had some bad infections with bites it is simply fantastic to use a product that works and smells good at the same time and of course does not contain Deet! We live by the sea as well so it is a well used product in our home and to take away. I used this repellent in Africa and it worked a treat not only against mosquitos but also tsi flies! Thanks Hebe Botanicals for producing a deet free repellent that actually works. I bought this repellent to not only use on my family but also one of my young cats who seems to have an allergy to mosquito bites. So far it appears that he's avoided being bitten again so thumbs up there. Also, the smell is lovely and he doesn't mind it being on him - I put it on his head between his ears. I can smell it there for hours after, so presuming it is still active all that time. I would recommend this product. Used it last night and was completely unbitten by mosquitoes, in same place and time of day, same weather conditions as the previous evening when I was bitten multiple times. I could see them, but they stayed away. I am, according to 23andMe DNA analysis, irresistible to mosquitoes. I thought I was doomed, as I've tried about everything else. I'm happy to report that SAFE works! What a relief. Thank you. I would get devoured without this stuff! Mosquitos absolutely love me--I have at times had 19 bites at one time (truthfully no exaggeration),and to make matters worse, I have a severe adverse reaction to them--always. Took Safe to Maui where I normally get bitten ruthlessly, and not one bite. Before finding this product, I had to wear long sleeves, long pants & socks in the heat of summer, and they'd still get me. This stuff is a Godsend. As effective as DEET on High Sierra mosquitos. You do have to re-apply a lot if sweating and it is expensive - a bottle doesn't last long when applied a lot since it isn't aerosolized. But if you are paying this much already cost isn't likely your number 1 priority. You can spray this liberally around your face, accidentally hit your mouth, and rest assured it isn't a solvent like DEET. Well worth it. I was blown away by how effective this was for me in the jungle of Peru. While friends were swarmed and snacked on, I walked away with two bites for a four day visit to deep jungle. It truly was impressive and as sensitive as I am to chemicals, I had no side effects whatsoever. The smell was clean and light and it is my new go to favorite. I highly recommend this product. The customer service and shipping were an added bonus to a very effective repellent. Thank you! I haven't used the product yet but have had really good dealings with Hebe Botanicals, fantastic to deal with. The repellent smells nice so am glad I've invested. Great repellent. Took to Vanuatu with us. I put it on everyday and I never got bitten. Have cancer and it was safe for me to use. Goes a long way too. 8 adults using daily and didn't finish the bottle. I'd highly recommend. At last a genuinely safe insect repellent that actually works! A great creation Hebe Botanicals! Works like a dream and like the comments below say, it does last for ages. We are fans and we are spreading the word as there are lots of people who could benefit from this if they only knew. We will be taking it to Africa in August. this stuff is amazing. hardly any smell, keeps mossies away all night and best of all no nasty chemicals. have been telling everyone else to get it! I normally don't get bitten much, though my husband gets absolutely demolished (lucky me) and this is the best repellent he's ever used ! The smell is quite faint and pleasant (a little bit lemony and vanilla) and it lasts for ages. We're off to Vietnam soon and will be stocking up for sure - love this product ! This product was recommended as a safe alternative to a number of products that contain those nasty chemicals that make us sick. As the name implies, it is SAFE. My wife, who is a walking smorgasbord for biting insects, enjoys being able to walk the beach without getting bit again. I used to get eaten alive when I worked out in the garden especially one area that I named sandfly corner now after spraying the repellent I can go any where without getting bitten. Thank you. There is nothing more irritating than having insects landing on you. Having them bite you and having to live with the effects of a bite is even worse. This time of this year we are plagued by irritating flies which land and reland continually. One light spray over arms legs and the bald patch on my head and they left me lone for the whole evening. A product that is worth its weight in gold with no nasty side effects. I have tried so many kinds of natural insect repellent and none of them actually worked until I used SAFE. It worked like magic and completely save me from hiding inside. Now i can properly enjoy summer and go out and about! have recommended to many friends, great product, thank you. Have not yet used it as we leave N Z tomorrow.It comes highly recommended from the tour company. I have ordered this product last year and because of the fabulous results placed another this year. I feel really happy to spray my grandchildren with this SAFE repellent knowing I am not harming them , but also the environment. Thank you for a really great product.